Two of the most visible and important trends in higher education today are its exploding costs and the rapid expansion of online learning. Could the growth in online courses slow the rising cost of college and help solve the crisis of affordability? 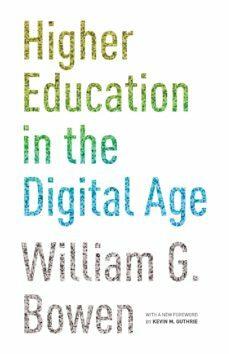 In this short and incisive book, William G. Bowen, one of the foremost experts on the intersection of education and economics, explains why, despite his earlier skepticism, he now believes technology has the potential to help rein in costs without negatively affecting student learning. As a former president of Princeton University, an economist, and author of many books on education, including the acclaimed bestseller The Shape of the River, Bowen speaks with unique expertise on the subject.Surveying the dizzying array of new technology-based teaching and learning initiatives, including the highly publicized emergence of "massive open online courses" (MOOCs), Bowen argues that such technologies could transform traditional higher education--allowing it at last to curb rising costs by increasing productivity, while preserving quality and protecting core values. But the challenges, which are organizational and philosophical as much as technological, are daunting. They include providing hard evidence of whether online education is cost-effective in various settings, rethinking the governance and decision-making structures of higher education, and developing customizable technological platforms. Yet, Bowen remains optimistic that the potential payoff is great.Based on the 2012 Tanner Lectures on Human Values, delivered at Stanford University, the book includes responses from Stanford president John Hennessy, Harvard University psychologist Howard Gardner, Columbia University literature professor Andrew Delbanco, and Coursera cofounder Daphne Koller.